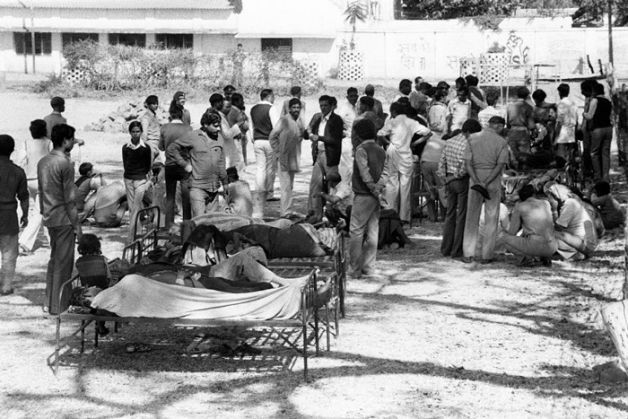 The world saw its worst ever industrial tragedy on the night of 2 December 1984, when 40 tonnes of methyl-isocyanate leaked from the Union Carbide India Ltd's plant in Bhopal. Water entered a tank containing 42 tonnes of MIC that night and the resulting pressure led to a large volume of toxic gases - 30 tonnes of MIC to be specific - being released into the air. Estimates vary on the number of deaths - ranging from the Madhya Pradesh government's official toll of 3,787 to 16,000 deaths, according to a number of other sources. The plant was surrounded by shacks and around 60,000 people were exposed to the leak. It is almost impossible to ascertain the exact death toll of the tragedy as countless are still living with toxins in their blood. The effects of the leak were passed on to the next generation, as studies have shown, and may be passed on to future generations as well. According to a 2014 report on the tragedy, a Bhopal Medical Appeal officer pegged the number of people struggling with medical conditions as a result of the leak at 1,20,000-1,50,000. The effects of the tragedy are truly horrifying. Pregnant women suffered spontaneous abortions after the leak. Many of the survivors are still battling health problems including gynecological disorders, respiratory issues, birth defects, and cancer. Flora and fauna in the area were also severely hit. Is this amount (Rs 2,500 approx) worth the lives of millions? This is how much Union Carbide saved per day by turning off the refrigerating unit. If not kept refrigerated to 0 degree C, MIC (methyl-isocyanate) - said to be 500 times deadlier than hydrogen cyanide - can react explosively with itself. While Union Carbide may have managed to slash costs by $37 a day on freon gas, this act also led to the massive gas leak. According to international norms, the maximum permissible storage limit for the deadly MIC is half a tonne. However, reports have revealed that the Bhopal plant often overrode this storage capacity. Over 90 tonnes of MIC were stored at times. On that fateful night of December 1948, 67 tonnes of MIC were stored in two tanks, Bhopal.net reports. 30 tonnes leaked out of the plant that night. In 1989, Union Carbide paid this amount (about $550 or Rs 37000 approx per victim) as settlement. According to a Guardian article which pegs the amount at 300 pounds a head the settlement, "taken over 25 years that works out at around 7p a day, enough perhaps for a cup of tea." Then CEO of UCC, Warren Anderson - and eight other officials of the plant were convicted in Bhopal on charges of causing death by negligence. Anderson died in September 2014. According to a 2014 Indian Express report, an estimated 350 tonnes of solid waste continues to lie within the ruins of the Union Carbide plant. Till date, during the monsoon, this waste seeps into the nearby areas polluting the water. Families living in the area still depend on this heavily contaminated water.